Click here to know the analysis of UPSEE-2015. UPSEE-2015 exam was held on April 19th, 2015 by Uttar Pradesh Technical University (UPTU) for admissions to undergraduate Management, Engineering and Medical courses at institutes in Uttar Pradesh. The students seeking admissions to B. Tech. courses have to appear in the paper-1 (Physics, Chemistry and Mathematics) of UPSEE-2015. The paper was conducted in offline mode and was available both in Hindi and English medium. Candidates were given three hours to solve a total of 150 questions of Physics, Chemistry and Mathematics i. e. 50 questions from each subject. All the questions were of multiple choice type and candidates were required to mark one option as the answer. For every correct response four marks will be awarded to the candidates and by there was no negative marking for the wrong answers. 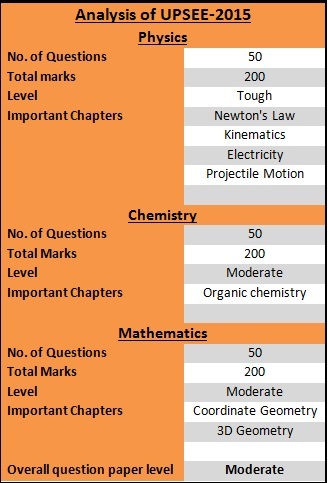 Below is the analysis of UPSEE-2015 exam. In 2015, over 3.5 lakh candidates have appeared in UPSEE-2015 for admission to various courses in different engineering colleges of the state. The exam was conducted in offline mode at different centres across 26 cities in Uttar Pradesh for around 1.5 lakh Engineering seats including around 4000 government college seats.